Two students sit on a bench during lunch at Rudsdale Newcomer High School in Oakland, California on January 28, 2019. Sánchez is one of more than 200,000 children and youth under 18 who since 2014 crossed the U.S. border without their parents. When a minor turns themselves in or is detained by immigration authorities, they are turned over to the Office of Refugee Resettlement, then sent to live with relatives or friends around the country as they wait for court dates to make their cases to stay in this country. Some apply for asylum; others for a special visa for minors who were abused or neglected by a guardian in their home countries. More than 28,000 of these children are living in California, most of them in Los Angeles and Alameda counties. Most are from El Salvador, Guatemala and Honduras. In their new communities, teachers, counselors and district leaders have had to come up with a diverse array of strategies to help them overcome a daunting set of obstacles to finish high school. Many students have survived severe trauma in their home countries, or missed years of school. If they are 16 or older, they only have a few years to learn English and catch up on math or literacy. Often, they have to work to send money home or pay rent. At the same time, these students have skills that teachers can build upon to help them succeed: in addition to Spanish, many also speak an indigenous language; some have years of work experience in their home countries; and, having traveled so far and endured so much, they are often determined to succeed. “The best practices are really flexibility and having a number of different options for students, because really there are so many different stories and needs and backgrounds,” said Julie Sugarman, a researcher who authored a report on supporting immigrant and refugee students to finish high school for the Migration Policy Institute, a nonpartisan think tank based in Washington, D.C.
“We never want folks to leave here feeling like they can’t come back if they need something, like they let us down or they disappointed us,” said Elizabeth Paniagua a counselor at Oakland International High School. Sánchez’s story illustrates some of the challenges faced by students who came to the U.S. alone. He left Honduras fleeing violence and extreme poverty, after his family lost all their crops. After being held in detention at the border and then sent to a shelter, he was released to an uncle in Oakland, whom he had previously known only through long-distance phone calls, while he waited for an immigration hearing. It was a difficult living situation — they didn’t get along and eventually, Sánchez had to move out. With the help of pro bono lawyers that he found through the school district, he was able to get a visa and eventually a green card. Back in Honduras, Sánchez had been the student body president of his high school. Here in Oakland, he was deeply motivated to graduate. So even when he found himself homeless, he kept attending Oakland International High School, first living in a homeless shelter, then commuting from the closest apartment he could afford in San Leandro, 13 miles away. To pay rent and send money home to his mother, he began working as a dishwasher, then as a cook. Sometimes he worked from 5 p.m. to 3 a.m., waking up early to go to school. Then his brother was killed back in Honduras. It was too much. Feeling overwhelmed, alone, unable to make ends meet and unsure of his future, he stopped going to school, just months before graduation in 2017. He was 20 years old. It would be more than a year before he returned. Newcomer school counselor Elizabeth Paniagua speaks with a student about switching from Oakland International High School to Rudsdale Newcomer High School on January 29, 2019. Alameda County has received the second-largest number of unaccompanied minors in California, second only to Los Angeles. The largest school district in the county, Oakland Unified, experienced a spike in newcomer students over the last five years. 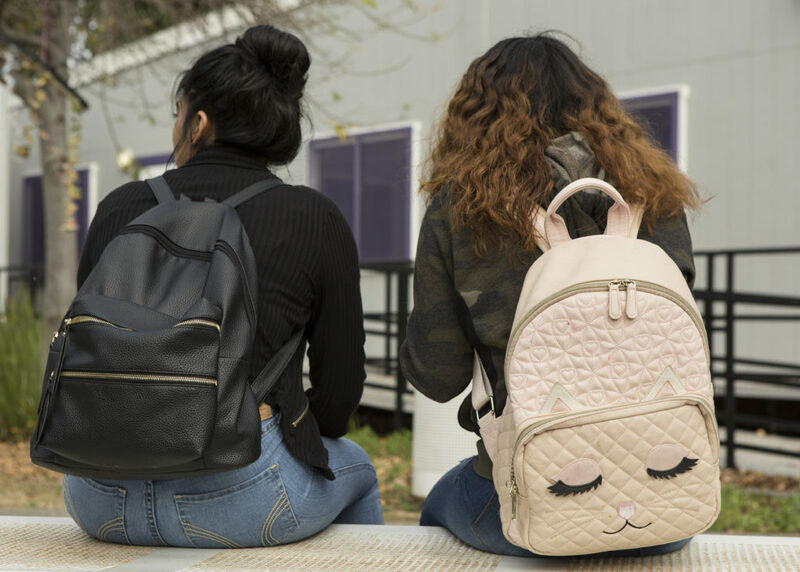 The district was forced to respond by opening up new programs across the city, hiring a coordinator to track and support those students who had crossed the border alone and working to connect students to legal services and mental health therapy. Still, a few years after these students began to arrive, it became clear that they are more likely than others to drop out before finishing high school. School counselors like Elizabeth Paniagua at Oakland International High School are key to ensuring they don’t. Oakland International was established in 2007 and is part of a nationwide network of schools that serve immigrant students from all over the world. Students come regularly to Paniagua to tell her it’s their last day at school before dropping out. She says she answers with “Tell me more,” and, in her head, she starts trying to devise solutions. Students younger than 18 are required to be in school, by law, but if they’re older, Paniagua can’t require them to stay. She says unaccompanied minors like Sánchez— those who crossed the border alone — are the most vulnerable. It’s common for students to have difficulty with guardians, even when they’re their parents. But she says she’s learned it’s important to involve the adults in parent conferences and phone calls home, even when it seems like they don’t have a strong relationship. School staff also hold workshops to help families deal with issues that come up after long separations. Paniagua is persistent with students and at the same time understanding about their struggles. She’s big on not judging students, keeping her door open for the future. “We never want folks to leave here feeling like they can’t come back if they need something, like they let us down or they disappointed us,” she said. And they do often come back, sometimes months or years later, wanting to finish high school or apply to college. Sánchez tried twice to return to school but could never stay for long. But then, last fall, more than a year after he had dropped out the first time, he came back to Oakland International, saying he was ready, determined to get his diploma. By then, he was already 21, too old to enroll in high school, but Paniagua and her colleagues helped him sign up for an independent study program to make up his last few credits. Her reaction meant a lot. “Miss Elizabeth told me she was so happy and proud of me for going back to school,” he said in Spanish. Sánchez says he was told it could take him months to finish. It took him three weeks. In December, he walked across a stage to receive his high school diploma. He wants to go to community college, but for now, he’s still working to support himself and send money home, to invest in fields so his family and others can grow crops. If he can help give other families in Honduras jobs, he says, maybe he can prevent some violence and poverty in his home country. Students eat lunch and relax in the courtyard at Rudsdale Newcomer High School in Oakland, California. 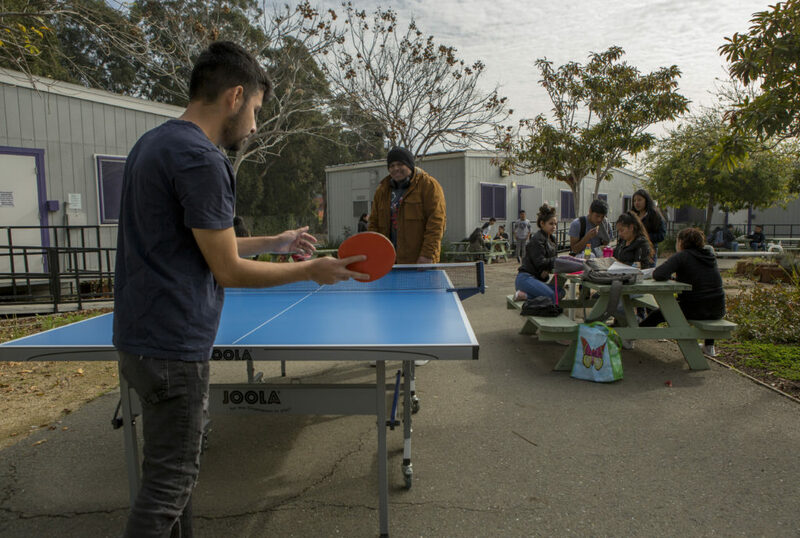 Students play pingpong in the courtyard during lunch at Rudsdale Newcomer High School in Oakland, California. Sánchez dropped out only a few credits shy of graduation, but many immigrant teenagers end up so far behind in credits that there’s no way they can graduate in time. A law passed last fall in California allows newly arrived immigrant students to enroll in a fifth year of high school, if needed, but they still need to finish before they turn 21. For students who were born in the U.S. and are struggling to complete high school, continuation high schools are one option to avoid them dropping out completely. These schools are often small and offer the ability to graduate with fewer credits than traditional high schools and they usually have a modified schedule, to help students who work. But they aren’t usually set up for immigrant students who are still learning English and who may also have experienced significant gaps in their schooling. 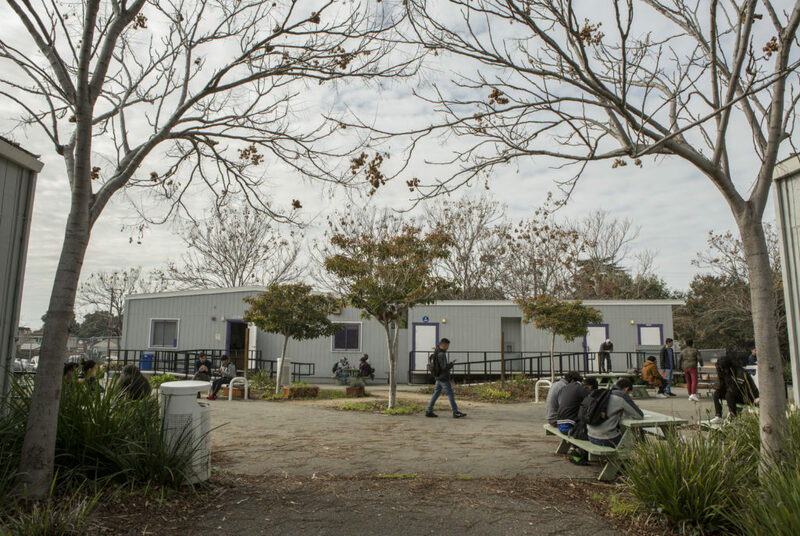 So in August 2017, Oakland Unified opened a new continuation high school, Rudsdale Newcomer High School, just for immigrant students who are 16 or older, have been in the U.S. for fewer than three years and who need to work or care for their families. It is thought to be the only continuation school in California focused on recent immigrants. “We’re constantly talking to the students about, ‘Let us know if your schedule changes, we can put you on independent study for a short time, or we can work something out. Let us figure out a plan together. Don’t just drop off the face of the earth,’” said Emma Batten-Bowman, assistant principal at Rudsdale Newcomer High School. Before designing Rudsdale Newcomer, Oakland Unified surveyed former and current newcomer students to see what had motivated them to stay in school or drop out. Classes start an hour later and end an hour earlier than other Oakland high schools and there is no homework, all of which make it easier for students who work in the evenings. Most of the students came to the U.S. as “unaccompanied minors,” but there are also those who migrated with their parents, like one of the first graduates, a girl from Honduras who asked only to use her middle name, Yamileth, because she and her family were targeted by a gang in her home country. She now has asylum in the U.S. By the time she enrolled in Rudsdale Newcomer, she was 20 years old, had already attended two other Oakland high schools, but was behind in credits and couldn’t have graduated before turning 21 at any other school. She describes it as a place where she trusted the teachers and could ask questions when she didn’t understand. The teachers were playful and warm, but also good at explaining lessons. “I knew that there wasn’t another person there that knew more than me, and I didn’t feel less than anyone,” Yamileth said in Spanish. 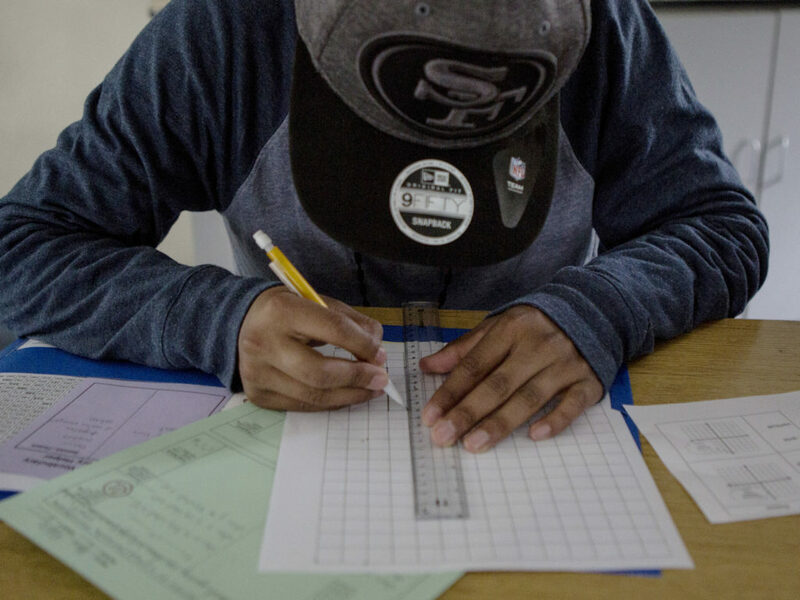 A student practices graphing in Algebra I at Rudsdale Newcomer High School in Oakland, California. 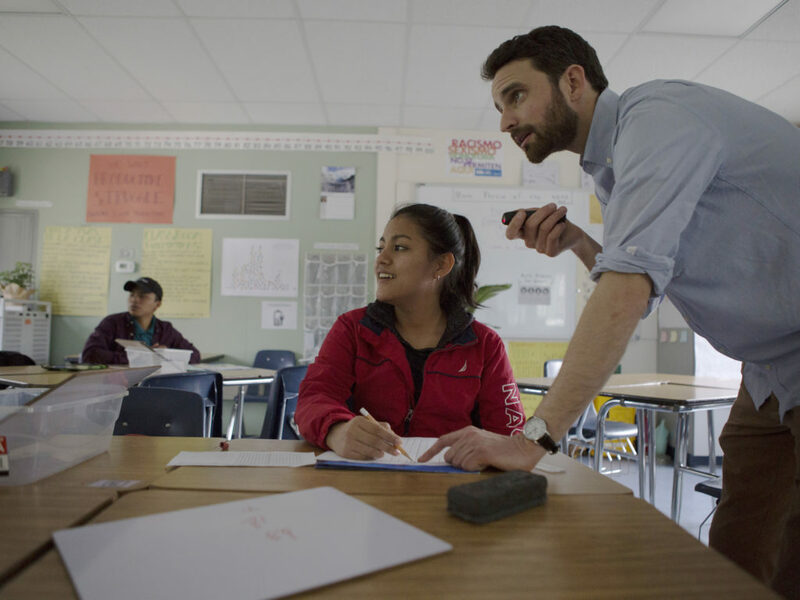 Teacher Nick Johnson points out instructions with a laser-pointer in Algebra I at Rudsdale Newcomer High School in Oakland, California. 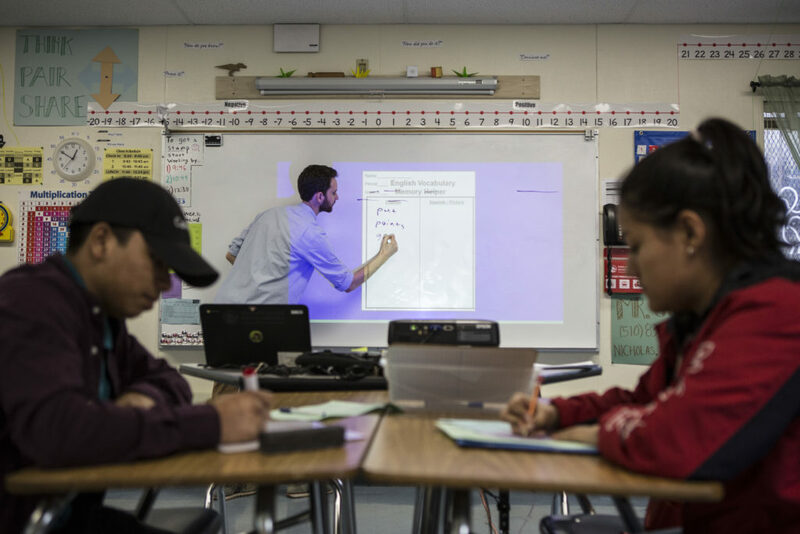 Students take vocabulary notes as teacher, Nick Johnson, writes unfamiliar words on the board in his Algebra 1 math class at Rudsdale Newcomer High School in Oakland, California. Assistant Principal Emma Batten-Bowman says getting students to show up to class is a big challenge, but she and other staff try to offer flexibility, allowing a student who is a mother to go home and breastfeed between classes, for example, or giving students time off. “We’re constantly talking to the students about, ‘Let us know if your schedule changes, we can put you on independent study for a short time, or we can work something out. Let us figure out a plan together. Don’t just drop off the face of the earth,’” Batten-Bowman said. In addition to mental health therapy and classes focused on literacy and math for those who are far below grade level, the school also offers some internships to improve students’ work skills. Some students interned this year at a local hospital and school leaders are looking into another internship at a dental clinic, where students could use their language skills in Spanish or Mam, an indigenous language in Guatemala. One of the biggest challenges for many recent newcomers from Central America is missed years of schooling in their home countries, either because they lived in rural communities where junior high or high school was not available, or because it was dangerous to attend school because students were targeted by gangs. “Not only do they need to practice phonics, but they need to learn how to read a map. They need to know, like, you put the holes on the left and write your name on the right,” said Batten-Bowman. This is a challenge across the country. When newcomers haven’t yet mastered academic reading, writing, or math in their home language, they have a lot more to learn in order to grasp high-school level material. But if content is designed for younger students, it can be boring for teenagers and make them more likely to drop out. A group of teachers and researchers affiliated with The Graduate Center at the City University of New York developed curriculum just for these students, called Bridges to Academic Success, which has students take two classes, one to learn to read and write in English and the other to learn literacy concepts, like character development and paragraph or plot structure. When teacher Jennifer Little of San Rafael, in Marin County on the north side of the San Francisco Bay, heard about it, she and two other teachers paid their own way to a training and are now using the curriculum in their classes. “They don’t treat them like children, they treat them like the older children they are, who have had a lot of life experience,” Little said. Abraham Falk-Rood, far right, teaches pronunciation for “This Little Light of Mine” to his mixed-level phonics class at Rudsdale Newcomer High School in Oakland, California. 18-year-old Carlos didn’t go to school regularly in El Salvador after 3rd grade. EdSource is not disclosing his last name because his asylum case is still pending. 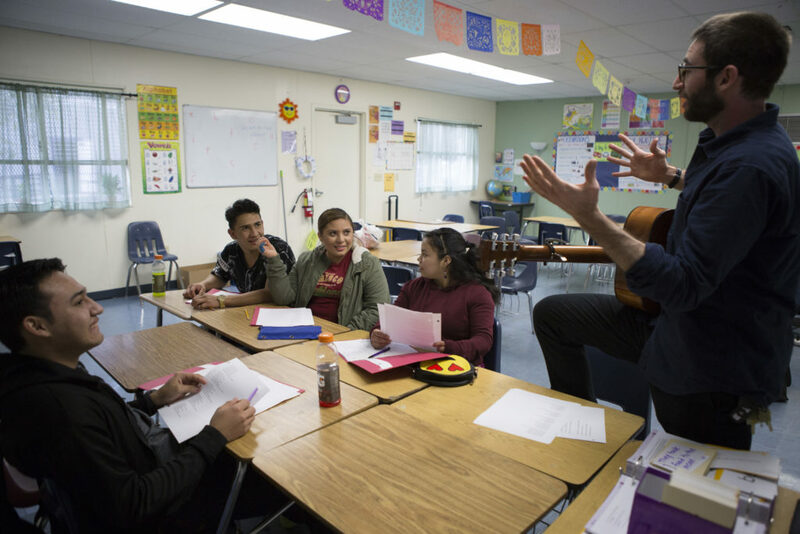 When he enrolled in 10th grade at El Cerrito High School, in Contra Costa County north of Oakland, in 2016, he says he felt completely alone, didn’t understand what was going on in class and the only thing that kept him coming back every day was a student group for English learners. The group was started three years ago by staff at the school-based health center. Technically it’s an “English Language Advisory Committee,” which all schools in California with a large number of English learners are required to have, but this committee is different than others — it’s made up entirely of students. To Carlos, it felt like a family. The group gave him advice on how to get closer to his mom, who he had come to live with after being separated for years and they encouraged him to go to therapy at the health center. They also helped him academically. His first year in El Cerrito, Carlos stopped going to chemistry, because he says the teacher told him if he couldn’t understand English, he shouldn’t be in her class, and she wouldn’t let him sit next to classmates who spoke Spanish. Two years later, he was still behind in credits and was told he couldn’t graduate. The English Learner group helped him negotiate one more year of high school. Carlos said advocating on behalf of other English learners and especially other immigrant students has motivated him to continue in school. As I critically analyze the reviews from a sociological perspective, there is evidence that points out that many comments support the current administration. Sadly, many of you are not aware of your own defeat. This current administration supports and protects the interests of the 1% percent and upper class individuals. Subsequently, there has been a tax break for that 1% social group in which negatively effects educators and students in a social and economic form. For instance, many of you do not question the ramifications of inequality behind the distribution of wealth and income. This issue currently is affecting you as educators, workers, and even the middle class. The growing inequality among social classes are affecting your ability to come together. There are more funds for schools, materials, students, and raises. We won’t have access to this until we get another president that furthers the interests of middle class, working class, and the poor. We need to increase the tax for the 1% and the upper class if we want to see more money coming into our schools. As individuals, we have fooled ourselves into thinking that a president that is part of that 1 % will further our class interests as the economic substructure. Many educators complain about the influx of immigrant students and lack of funds. But you carelessly continue to fool yourselves by attempting to identify with an upper class president.. Let that sink in. Free education at the expense of American taxpayers. The picture of the one boy shows a cast on his arm, I am sure the medical bill was picked up by citizen tax money as well. Along with housing and assistance. As Tom stated, this article shows the blatant agenda to make illegal immigrants into victims. Imagine how American students who comprehend English and other basic subjects are being held back because these immigrants cannot and will not assimilate. Once you get called a racist, you have won the argument. This piece illustrates why it is foolish to not control our southern border and allow anyone to sneak across our border. Much as we would like to help these kids and it is heartbreaking, we simply do not have the resources (funds) to teach these very under-prepared young people catch up academically to get to a place where they can get a good paying job. Many will turn to gangs and crime. Heck we cannot even get adequate money to K-12 schools right now not to mention how the severe pension shortfall will be funded. Our “no walls” politicians have no answer to this.